Website: Go online to www.elevation2477.com. Nevada County’s first medical and adult-use dispensary just took another ground-breaking step. On Wednesday, Elevation 2477’ got the OK from Nevada City’s city council to begin a delivery service, the first permitted delivery business in western Nevada County. Elevation 2477’ was awarded Nevada City’s only medical cannabis dispensary license in February 2018 and opened its doors in August 2018 on Searls Avenue. The dispensary’s owners soon began sounding out the city council about allowing adult-use sales, and in late January, Elevation 2477’ met one more hurdle after the city council unanimously OK’d the conversion of the authorized medical cannabis dispensary to an adult-use business. Elevation 2477’ last month requested an amendment to its prior application, to add delivery activity to its operation at 569 Searls Ave.
City Manager Catrina Olson told the council members that while the dispensary is allowed to operate a delivery component, Elevation 2477’ did not include delivery as part of its original application in 2017 and so that activity had not been authorized. “The applicant has since determined that delivery sales will strengthen their business,” Olson wrote in her staff report. The delivery service will be available to patients with a valid medical recommendation, as well as to customers over 21 who have pre-registered in person at Elevation 2477’ or who can provide a valid California ID. Driver vehicles will be unmarked and will be tracked via GPS, and IDs will be verified at the delivery location. The vehicles will also have video recording devices, drop-box type safes, and internal steel locking cages for the cannabis products. 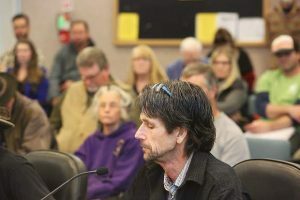 Co-owner Daniel Batchelor told the council the delivery vehicles will be Priuses and added that because the business is in Nevada City, all delivery sales tax revenue will come to the city. Olson noted there had been some concern due to the cash-only nature of the delivery activity. 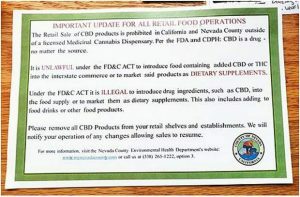 But, as co-owner Daniel Batchelor noted in his response, there are currently significant constraints with using traditional banking and credit card transactions for cannabis businesses. Staff recommended a condition be included that prohibits cash transactions when credit card transactions become a viable option, Olson said. “I see no reason to handicap a business that is following the law,” said Mayor David Parker before a unanimous vote to approve the amendment and allow a delivery component for Elevation 2477’.